Radiotherapy delivery is one of the most effective cancer therapies existing today, with a large fraction of society undergoing this at some point in their lifetime. While the delivery is safe, the delivery cannot be visualized directly by the patient nor the therapists, and so patient alignment and beam delivery relies upon a complex mixture of technologies. Cherenkov imaging has emerged as a way to capture real time delivery of radiation to tissue, using cameras that are tailored to detect this small light signal. 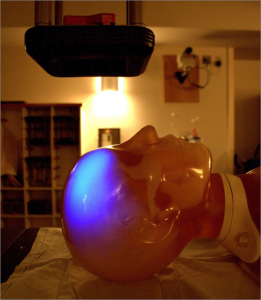 The design of these highly sensitive cameras and the signal processing of the images allows video mapping of radiation delivery with high temporal and spatial accuracy, potentially allowing a revolution in how this therapy is tracked and recorded.